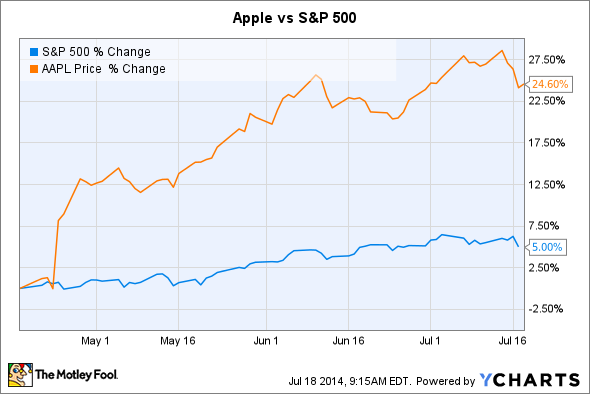 Quarterly reports from Microsoft and Apple could be the focus of tech investors next week. Earnings events are likely to remain the focus of tech investors next week, with two of the largest firms -- Microsoft (NASDAQ:MSFT) and Apple (NASDAQ:AAPL) -- set to post quarterly earnings. In addition to the companies themselves, those reports could affect major mobile suppliers (Apple) and PC-related names (Microsoft). Microsoft shares have been on a relative tear in recent sessions, rising more than 6% over the course of the last five trading days. Most of that gain has been prompted by the company's planned reorganization -- new CEO Satya Nadella has clarified his vision for the software maker. That vision doesn't include many of Microsoft's current employees -- as much as 18,000 of Microsoft's more than 127,000 employees are to be let go in the near term. Roughly half of Nokia's former handset division is being laid off, as are thousands of core Microsoft employees, including many in the Windows division. Microsoft is also giving up on its original programming ambitions, scrapping plans to develop TV series for Xbox Live. All of this news has already been baked into the stock, but investors should look to the company's earnings call to get a better sense of how management sees Microsoft's business evolving in the near future. Nadella has shifted Microsoft's mantra from "devices and services" to helping people "get stuff done" in a "mobile-first, cloud-first" world. This seems to suggest a greater focus on cloud services and software, and less of an emphasis on Microsoft-made hardware. 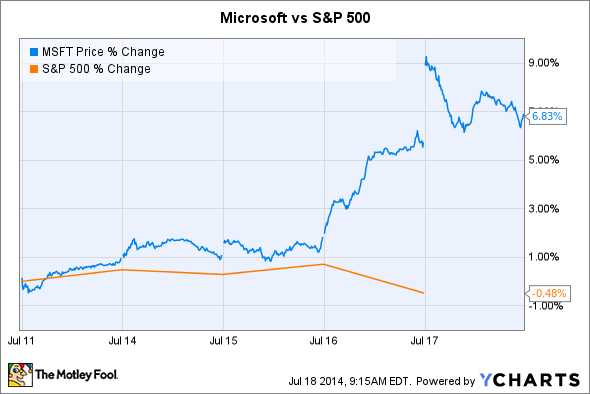 Microsoft is expected to report earnings after the closing bell on Tuesday, July 22. Analysts are looking for the Windows maker to post earnings per share of around $0.60 on revenue of roughly $23.06 billion. If Microsoft beats expectations, it may be on better-than-expected Windows revenue: An ongoing corporate PC refresh cycle has lifted shares of Microsoft's hardware partners. Apple shares have performed tremendously since the company's last earnings report, rising more than 24% over the last three months. For Apple, this is unlikely to be a particularly eventful quarter -- the company is, for the most part, still selling the same products in the same markets, and with its recently expanded capital allocation program, seems unlikely to announce any major financial adjustments. Although Apple unveiled some impressive software updates at its Worldwide Developers Conference in June, customers won't see the benefits until later this year. Guidance for future quarters may be interesting, with expectations running high for the iPhone 6 and a widely anticipated iWatch. Like Microsoft, Apple will report its quarterly earnings on Tuesday, July 22 after the closing bell. Analysts are looking for earnings of around $1.23 per share on revenue of some $38 billion. As always, the focus will be product sales -- iPhone, iPad, and Mac. If Apple beats expectations, it may be because of stronger-than-anticipated demand for the iPhone 5s -- a recent report from Counterpoint Research revealed that the iPhone 5s continued to be the world's single best-selling phone in the month of May. iPad sales will also be key, as that business segment has seen some surprising weakness in recent quarters. Mac sales are of the least importance, but could see some unexpected strength, as Apple cut the price of the entry-level MacBook Air in April.